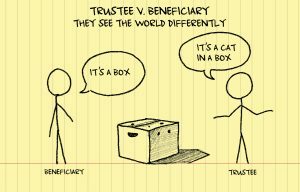 Trustees and beneficiaries don’t always see eye-to-eye on issues of trust administration and governance. For the most part, the reasons for these disagreements are divergent beliefs about responsibility, duty, fairness, and transparency. Then the attorneys are called and nobody wins. At the heart of all of these conflicts is a single issue–did the trustee act prudently and in good faith? Central to litigating this issue are the questions (1) what is the trustee’s job, and (2) what evidence exists that they did their job? The job description for a trustee is found in several places: (1) in the trust document itself; (2) in the state’s statute that adopts the Prudent Investor Act; and (3) in the court’s historical interpretation of what the statute means. At the initiation of any occupancy of the trustee’s office, the successor trustee will create a record of the duties of care they owe to the trust beneficiary. This document would reasonably be the first document in the compliance library. By establishing this series of policies and procedures and creating a record that they have been executed according to an established compliance calendar, the trustee has an evidentiary record that demonstrates they have acted prudently and in good faith. To be sure, the attorney for the disgruntled beneficiary will argue that another trustee might have reached a different conclusion than this trustee reached. But that is not the standard by which trustees are judged. Prudent fulfillment of their duties is the standard.